London, 22nd October 2018 – Britax Römer, the leader in child mobility, has today announced its new ADVANSAFIX IV R car seat. The first product of the new ADVANSAFIX series to launch this year, it is marked by its unique design and superior comfort for children and parents alike. The multistage, Group 1/2/3 ISOFIX seat grows with the child in a few simple steps from 9 to 36 kg (≈ 9 months – 12 years), whilst retaining excellent safety features for both toddlers and children. The ADVANSAFIX IV R features the excellent safety standards for which Britax Römer products are well known. From 9 – 18kg (≈ 9 months – 4 years), the car seat is used with a 5-point harness which keeps the child safe and tight in the seat’s protective shell. In the event of a collision, the harness distributes the forces of the impact across 5 points. For older children from 15 – 36kg (≈ 3.5 – 12 years), the car seat becomes a highback booster with deep, protective side wings. Together with the adjustable SICT, it provides superior side impact protection. 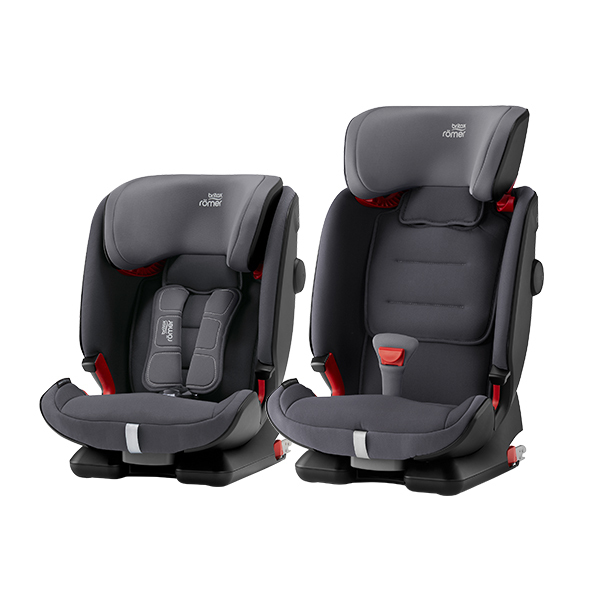 Britax Römer’s SecureGuard technology offers unique frontal impact protection for older children, as it helps protect a child’s delicate abdominal area by adding a fourth contact point to the 3-point seat belt. By keeping the lap belt in an optimal position over the child’s pelvic bones, SecureGuard helps reduce abdominal forces in the event of a frontal collision by up to 35 percent*. In the event of a frontal collision, Britax Römer’s patented Pivot Link ISOFIX system directs the force downwards into the vehicle seat, thereby decreasing the risk of head and neck injury, while the Top Tether with rip stitch technology helps reduce the forward movement of the child. The Top Tether’s unique stitch pattern has been designed to progressively rip in a controlled fashion, absorbing the force of the frontal impact. The special V-shaped form of the headrest controls the movement of the child’s head in an impact. Children will enjoy the luxury of comfortable car journeys thanks to lots of inner space, an ergonomic headrest and soft neoprene chest pads on the 5-point harness. These fit comfortably on the child’s chest and help reduce his or her movement in the event of a collision. With the EasyRecline feature, parents can adjust the car seat position during the journey for cosy naps. The three comfortable recline positions can be adjusted while the child remains in the seat, meaning there is no need to disturb the little one while he or she is sleeping soundly. Featuring a new FLIP&GROW function, parents are now able to switch seamlessly from an integrated 5-point harness to a highback booster in just a few simple steps as their child grows. Made in Germany, the ADVANSAFIX IV R was completely developed, designed, manufactured and crash tested at Britax Römer’s local facility. The new premium design concept encompasses a sleek, rounded black shell and new stylish lower belt guidance. Thanks to this new design, three ADVANSAFIX IV R seats can be installed in the back row of selected vehicles, side by side. The ADVANSAFIX IV R comes in 10 colour options: Cosmos Black, Fire Red, Storm Grey, Moonlight Blue, Wine Rose, Grey Marble, Blue Marble, Crystal Black, Air Black and Air Silver. “Made with Care” is Britax Römer’s philosophy to provide the highest quality of products to customers. The majority of Britax Römer car seats and all of their car seat fabrics and covers are made in Europe. This is an important step in their commitment to tightening quality control and developing the safest possible products for children. Britax Römer has strong internal standards for chemical and mechanical testing for fabrics and other components. Britax Römer is pleased that its efforts have been recognised in this area with consistent, excellent scores from leading consumer organisations such as Germany’s Stiftung Warentest, ADAC and ÖAMTC. ADVANSAFIX IV R will be available from October 2018, with an RRP of £250.